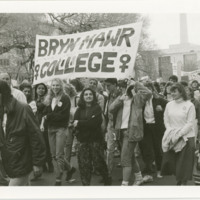 1989 "March for Women's Lives"
1989 "March for Women's Lives" in Washington, DC, students carrying banner reading "Bryn Mawr College", with female symbol, mounted on poles. Banner has wind holes. Many people in photo are wearing pins.